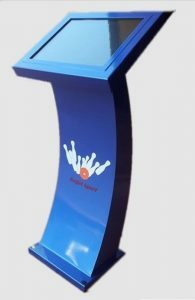 Our bowlers consoles are designed with the bowler in mind and feature a 17″ touch screen. The attractive metal cabinet houses the mini PC that executes the games software. The touchscreen displays the menu at your fingertip. It duplicates the picture to the overhead monitor.